Photo Gallery: Official Weigh-In Results for Gary Russell Jr. (125.5) vs. Joseph Diaz Jr. (126.0) -- Santa Cruz, Mares, Selby, Valdez, Frampton, More! 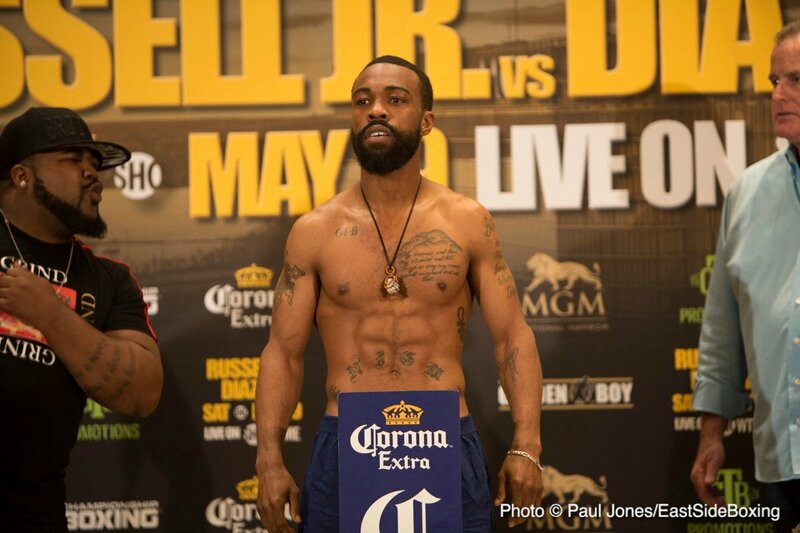 By Paul “Paparazzi” Jones | Photo © Paul Jones – OXON HILL, MD – When WBC world champ, Gary Russell Jr. (28-1, 17 KOs), and mandatory challenger, Joseph Diaz Jr. (26-0, 14 KOs), lock horns on Saturday night at the MGM National Harbor in Maryland, one thing is for certain: the winner will be one step closer to unifying a featherweight division that is bursting at the seams with talent and titlists. Indeed, Russell Jr. is joined by fellow champs Leo Santa Cruz (WBA-Super), Abner Mares (WBA), Lee Selby (IBF), and Oscar Valdez (WBO) in a deep division. Interim (WBO) champion, Carl Frampton, former world champ, Nonito Donaire, and the up-and-coming Diaz Jr. help round out the featherweight field. 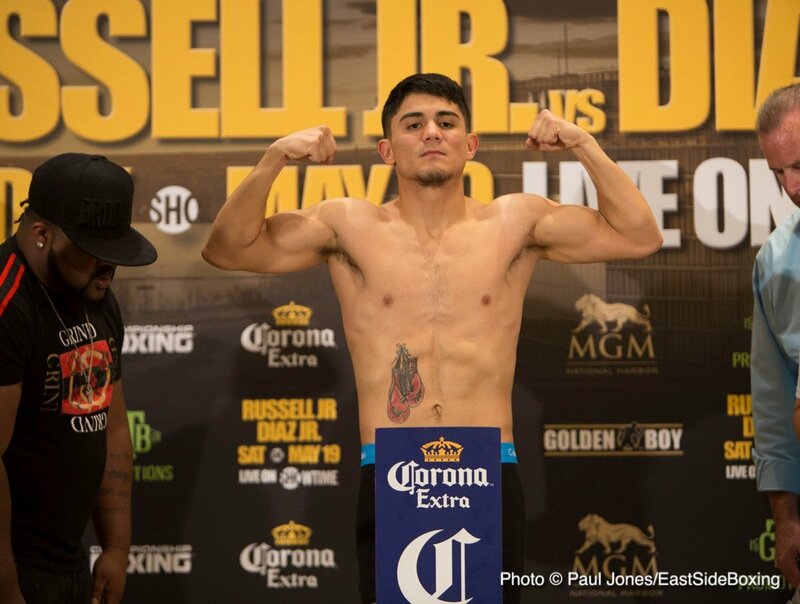 Nevertheless, Russell Jr.’s fight against the 25-year-old Diaz Jr., which opens Saturday’s split-site card (10:05 p.m. ET/PT), is a high-stakes affair for two reasons. First, a loss for the DC Native would effectively derail his hopes of unifying the division. Second, and equally important, a loss to Diaz Jr. dampens Russell Jr.’s case for a rematch with consensus pound-for-pound king, Vasyl Lomachenko. 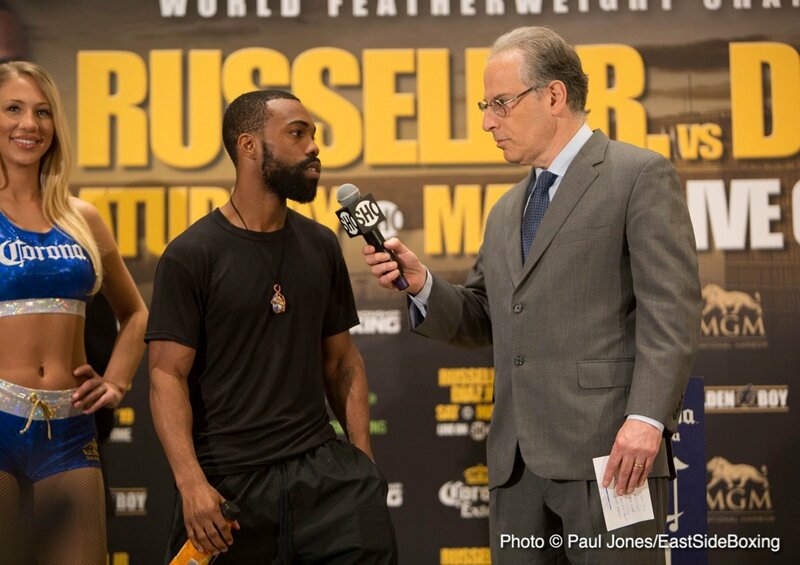 According to Russell Jr., a shot at avenging his only pro loss to Lomachenko remains atop his boxing bucket list, along with cleaning out the featherweight division. Given these subplots, boxing fans can expect an all-action matchup when Russell Jr. and Diaz Jr. enter the ring. 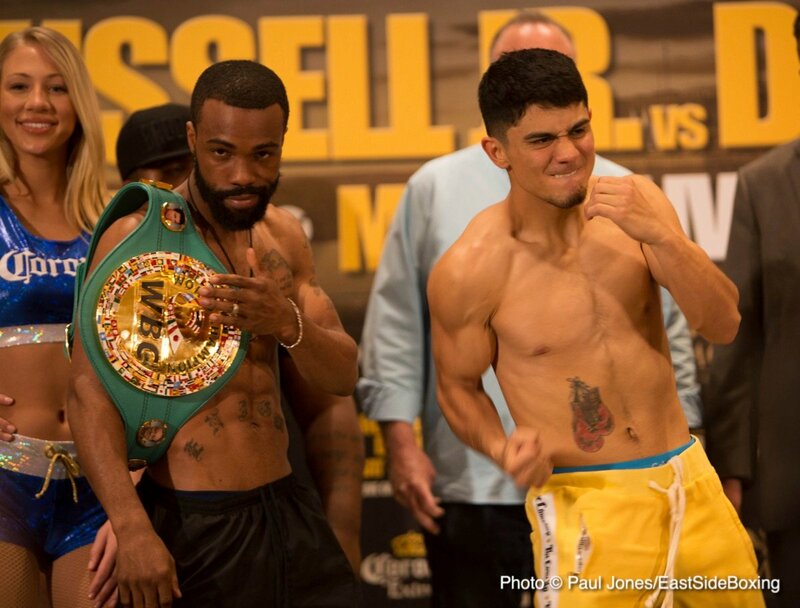 Fortunately, Friday’s weigh in results confirmed that Russell Jr. vs. Diaz Jr. is on. 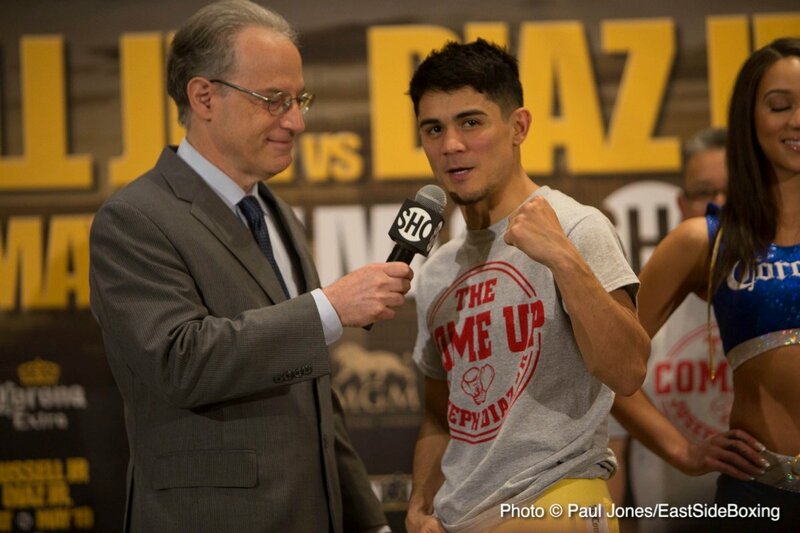 Russell Jr. vs. Diaz Jr. (Main Event) — 12 ROUNDS: Russell and Diaz face-off. This will be Russell’s third title defense, while mandatory challenger, Diaz, aims to keep his unbeaten streak alive and walk away with Russell’s WBC title. 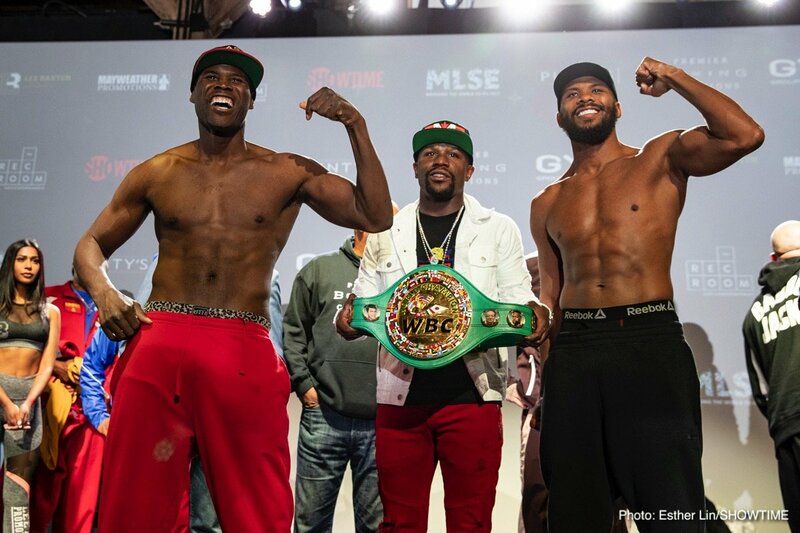 After Russell Jr. vs. Diaz Jr., fight fans would be well served to stay tuned to SHOWTIME CHAMPIONSHIP BOXING when the telecast coverage shifts to Canada (11 p.m. ET/PT) to chronicle an epic showdown between two of boxing’s finest: WBC Light Heavyweight champ Adonis Stevenson (29–1, 16 KOs) and Badou Jack (22–1–2, 13 KOs). Stevenson will defend his title against Jack in a bout that could produce a Fight of the Year candidate. RUSSELL JR. 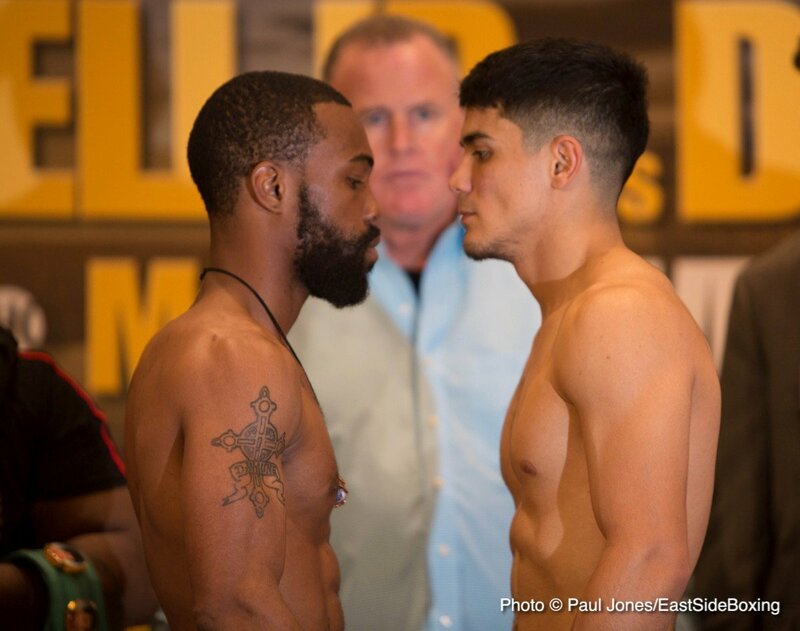 VS. DIAZ JR.
You are here: Home / Boxing News / Photo Gallery: Official Weigh-In Results for Gary Russell Jr. (125.5) vs. Joseph Diaz Jr. (126.0) — Santa Cruz, Mares, Selby, Valdez, Frampton, More!